Today, the Church honors a member of the Cistercian Order a blessed of the Church, an Italian nun, Blessed Maria Gabriella. A native of Sardinia, Italy born in 1914. 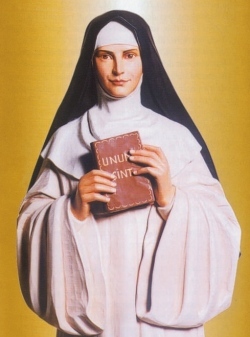 Blessed Maria Gabriella was known to be given to willfulness, stubbornness and anger as a child and adolescent, but a conversion at 18 turned her will toward virtue and the love of Jesus Christ. Then, at 21, she entered a Cistercian monastery near Rome where she lived the contemplative, hidden life of a Trappistine nun. In her era, she likely knew nothing of the ‘ecumenical movement,’ at least not in any official way. In purity of heart –in a singular gesture– Sister Maria Gabriella offered her life for the Unity of the Church for all Christians. In 1938, shortly after the offering of herself to the Lord, the symptoms of tuberculosis were diagnosed, and she died of this disease on April 23, 1939 (Good Shepherd Sunday), Her 15 months of suffering was an oblation. On January 25, 1983, Pope John Paul II beatified her and named her patroness ‘of Unity’. She is a 20th century witness to our world that we have a responsibility for the restoration of the unity of Christians is the Love of Christ, personal conversion, sacrifice and prayer. O God, eternal shepherd, who inspired Blessed Maria Gabriella, virgin, to offer her life for the unity of all Christians, grant that through her intercession, the day may be hastened in which all believers in Christ, gathered around the table of your Word and of your Bread, may praise you with one heart and one voice. Through Christ our Lord.